Question: Are Blue and Liver German Shepherds a different breed from traditionally colored German Shepherds? Are they a mixed breed? Answer: Blue and Liver German Shepherds are no different from traditionally colored German Shepherds. 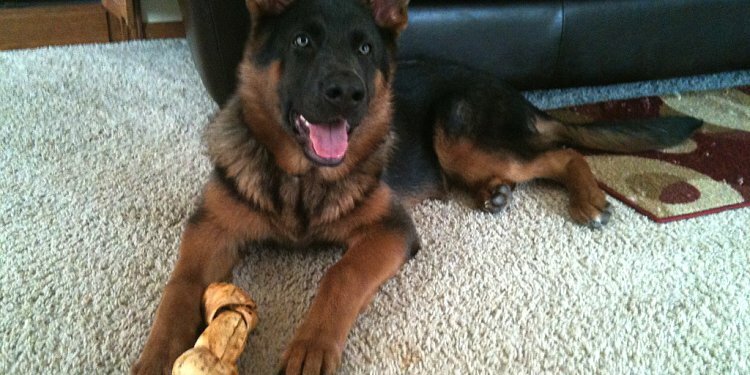 They are in fact purebred GSDs, and often are born in a litter with traditionally colored littermates. The Blue and Liver coat colors and skin pigmentation are each caused by receiving two copies of a recessive gene. The Blue gene is a dilution gene which dilutes any black pigment present on the dog, and the Liver gene completely blocks the formation of black pigment alltogether. Visit our Genetic Information Page for a simplified explanation of the genetic activity that causes these two colors to be expressed. Question: Can Blue and Liver German Shepherds be registered as GSD's? Answer: Yes, since it is simply a color variation, they are fully registerable by the AKC (American Kennel Club), the CKC (Canadian Kennel Club), the UKC (United Kennel Club) and all other applicable registries. Question: What sanctioned events can Blue and Liver German Shepherds compete in? "We believe that many have wondered why the new Standard explicitly demands a black nose. As the blues have grey noses and the few surviving livers have brown noses, we think the reason is clear. It is the one means to bar off-colors in the show ring. If they are not allowed to be shown, they will not be bred from by serious breeders. There is no more reason to allow a German Shepherd Dog with a grey or brown nose in the ring, than to allow a white German Shepherd Dog with a black nose, in our opinion. The off-colors are due to recessive genes, and they could become so strongly entrenched in the various bloodlines that an average of 25% of every litter could be off-color."